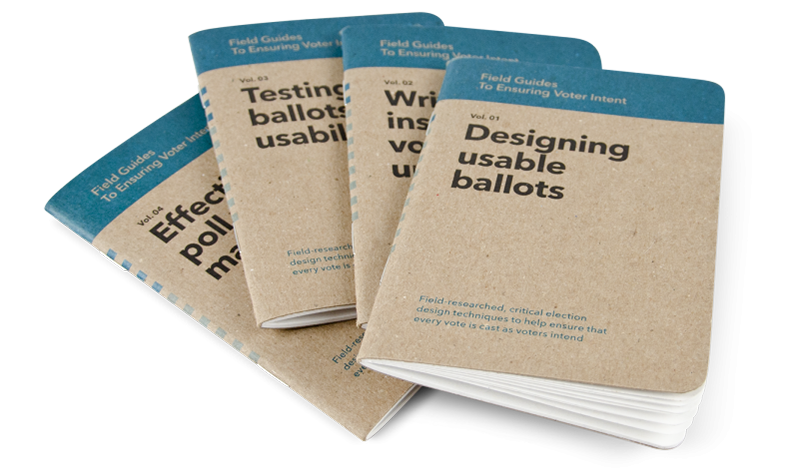 The Centre for Civic Design, based in Maryland, USA, states ‘Democracy is a design problem.’ A problem they have set out to tackle with the Field Guides to Ensuring Voter Intent, a series of small design guides for election officials. Researched and compiled by Dana Chisnell and Whitney Quesenbery, with help and design from Oxide Design Co., the guides offer to-the-point guidelines on 8 different aspects of election communication. This ranges from designing ballot papers to signage in polling stations and election department websites. In the 2000 presidential election in the USA the design of one ballot paper in Florida was so problematic that it resulted in not only hundreds of unintended votes, but ultimately lawsuits and harsh critique aimed at the election official that designed the ballot paper. In the context of design part of what’s troubling about this incident is that the official has gone on record to say that the confusing design was actually the result of her attempt to make ballots easier to read. Her good intentions however resulted in the punch hole for Al Gore becoming confused with that of the Reform party candidate on the opposite page. This incident, it’s been said, stimulated ernest discourse around improving ballot design but after two more elections a dramatic shift had not taken place. In mid-2007 design guidelines were put in place, with contributions from AIGA’s Design for Democracy project and published in a thorough U.S. Election Assistance Commission report. It is from this context that the Field Guides emerged as a considered effort to further improve the situation. 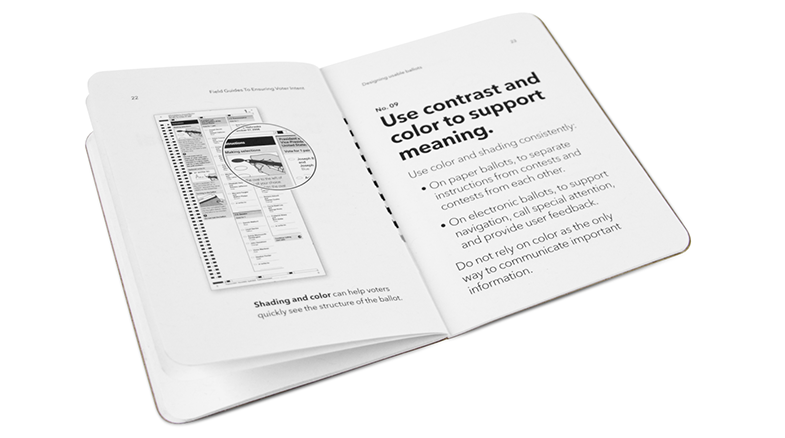 The guides acknowledge the reality of who is often designing communication materials around election — non designers, not necessarily well versed in design theory. It also recognised that communication with voters is one part of a much larger, busier and complex schedule around election time and that anything which would move election officials to act would have to compete with a number of other concerns for their attention. With this in mind the guides are based on in depth and informed research but have distilled this into a manageable format that would feel relevant and feasible to the people who would ultimately put the guidelines into practice. The guides practice what they preach, with a functional, not overly designed aesthetic. The structure is clear — examples on the left, guideline on the right, things to avoid in grey, things to do in black and illustrations where needed used to illustrate a point. 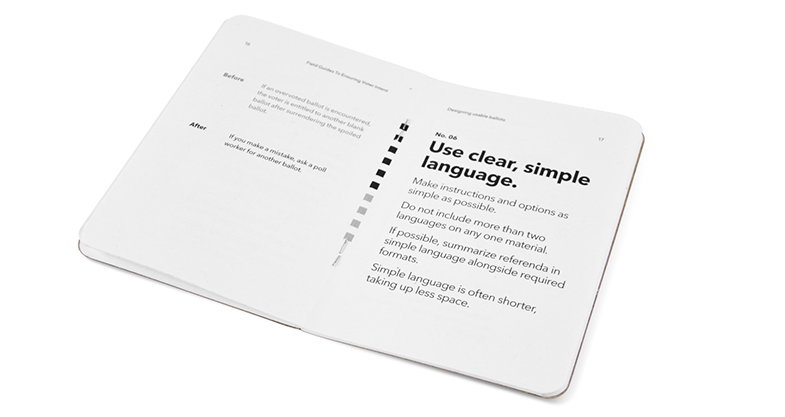 The small, compact format with detailing like the round corners helps the guides feel unintimidating and manageable. While the confident, authoritative voice and straightforward language belies the research that is the foundation of these humble looking booklets. 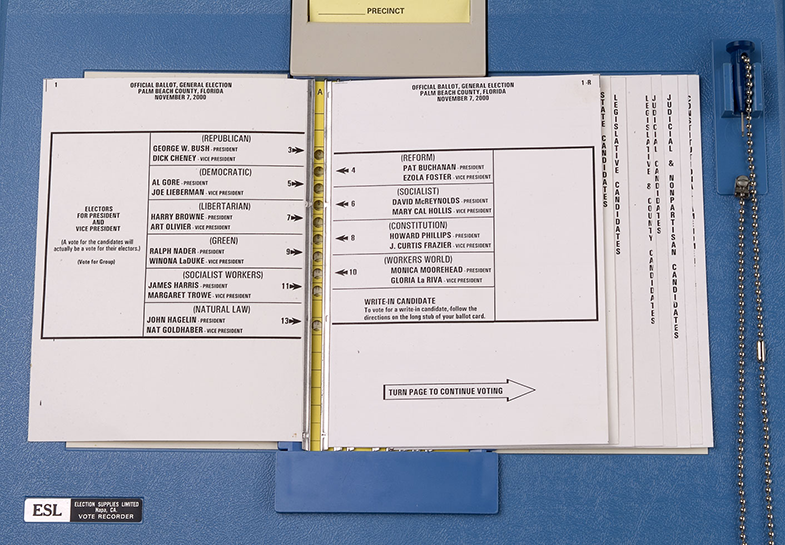 All images, except original ballot card, courtesy Oxide Design Co..